The Gig-FX roster of users includes such names as Prince, who played the Chopper tremolo pedal on Saturday Night Live; Adam Jones of Tool; Juan Alderete of The Mars Volta/80s glam shred band Racer X; Adrian Belew of King Crimson/Bowie/NIN; Mark Tremonti of Alter Bridge and Creed; Living Colour’s Wil Calhoun; and Richard Fortus of Axl Rose’s latest incarnation of the Gunners. The Gig-FX Mega-Wah combines six wah effects and a volume pedal, in a sturdy, practically bombproof construction. The wah modes include Classic, in mono or stereo; Mega-Wah, which is described as the Classic wah on steroids; Trig-wah, a funky envelope filter type effect; Auto-wah, a straight-forward touch wah effect; Stereo- Wah, in which two circuits give twice the awesome wah power, especially good for use in stereo effects chains; Stereo-Reverse Wah, which reverses one channel for some phasey phreakiness; and Foot-volume control (does what it says on the tin). The Mega-Wah operates with optical technology, which uses an LED array and an optical sensor to control the effect. In this design, the closer the LED gets to the array, the more intense the effect. 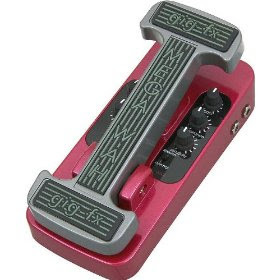 It’s a method used on some other high end wah pedals, tremolo and compressor pedals, and the entertainingly squeaky Digitech Whammy Pedal, and it provides a very smooth taper difficult to achieve with traditional pots. The coolest feature of the Mega-Wah is the Stereo-Reverse mode. The ability to have one side wahing up while the other wahs down is undeniably funky. It reminds me, bizarrely, of Eddie Van Halen’s rarely heard and unorthodox wah technique, where he tends to rock the pedal backwards rather than forwards so the wah sweep goes from high to low instead of the other way around. This is such an attention-grabbing sound, especially in the context of 40 years of standard wah operation, that its inclusion here is a further breath of fresh air for this innovative pedal. The Classic mode has all the vibe and tone of the original pedal it pays tribute to, while Mega-Wah takes it a step or two further. Trig-Wah sounds especially great with bass for those phat Bootsy Collins moments.